In winter the closest activity to hiking is snowshoeing. The biggest difference is that you need snowshoes to keep you from sinking in the snow. If you already own snowshoes you are ready. Just dress warm and get out there. If you don’t yet own snowshoes there’s good news! There are 32 places across the province where you can rent snowshoes. Some of them are even free! The following map shows all of the locations and the details for each, along with links if you want more information. Now you have no excuses to get out and enjoy this beautiful province year round. Your health and happiness will thank you for it. If you are not ready to try it on your own there are many group snowshoes coming up. 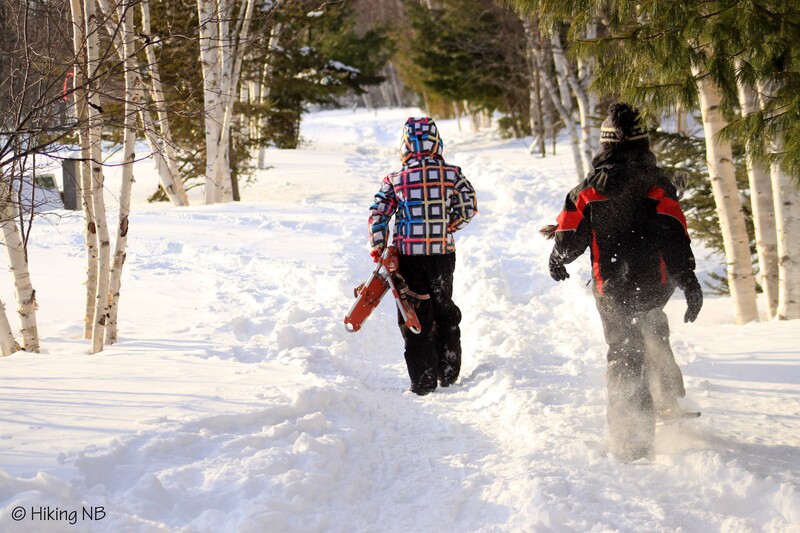 For a list of group snowshoeing events throughout the province go to the Hiking NB events page. If you know about any snowshoe events that aren’t listed please let us know. For ideas on what trails to visit in the winter check out the Top Trails for Snowshoeing and Winter Hiking blog post I wrote for Tourism NB. Blue – Confirmed Location, more details to come. Note that this map is a work in progress. If you know of any other locations or have more details about snowshoe rentals in the province please email me at james.donald@hikingnb.ca. Disclaimer: Although I have confirmed all locations it is always best to call ahead to confirm availability.